Not long after X-rays were discovered in the early 20th century, medical professionals recognized their value as important diagnostic tools. They revealed structures hidden inside the body not otherwise visible to the naked eye. But these images were two-dimensional and subject to interpretation. At the dawn of the 21st century a revolutionary new technology has entered the diagnostic arena. Today, 3D Cone Beam Computed Tomography (CBCT) has changed the way many dental problems are diagnosed and treated. CBCT is a quantum leap forward in technology and diagnostic precision. For the dentist, it offers the ability to accurately visualize in 3D (within 1/10th of a millimeter) intricate structures inside the jaw, including root canals, bone structure, nerves and sinuses (air-filled spaces). For the patient, it can reduce the need for invasive procedures, shorten treatment time and offer the chance for a better outcome. Regular 2D X-rays images, like visible light, are a form of energy on the electromagnetic spectrum. Just as light makes an image on photographic film (or a digital camera sensor), X-rays can also form an image. The difference is that energetic X-rays can penetrate bone and soft tissue and reveal hidden structures by their varying degrees of absorption. In other words, they form a grayscale picture of what is underneath the surface. But conventional X-rays are limited similar to a still-life picture, as they show only one perspective on the scene. In addition, they can magnify and distort objects in the image leading to inaccurate measurements. With CBCT 3D imaging we can do so much more! Using a rotating imaging device that moves around the patient, the CBCT scanner records multiple low-exposure images, and then a powerful computer processes the information and creates a virtual model of the area under study. When it is done, a 3D image that is like a sliced loaf of bread appears on a computer screen. You can pick the whole loaf up and rotate it to see the outside of each side individually. Or you can make the slices thicker or thinner, and you can remove each slice and view that slice all the way through. Unlike 2D images that distort and magnify objects, 3D CBCT imaging allows you to accurately measure objects, or the distance to critical nerves, sinuses, etc., to within 1/10th of a millimeter! 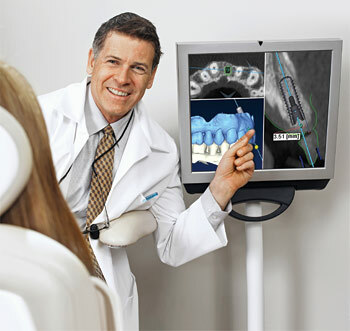 In addition, your doctor can use 3D CBCT imaging to virtually place a 3D dental implant within the 3D image, and from that create a dental implant surgical guide to help them PLACE A DENTAL IMPLANT WITH MORE ACCURACY THAN ANY OTHER TECHNIQUE AVAILABLE TODAY! More accurate information means more predictable and better treatment for our patients. The doctors feel that 3D CBCT imaging is so critical for the most accurate and predictable implant placement that both the CBCT AND the surgical guide are reimbursed in full if your dental implant is placed in our office. Dental implants: Detailed CBCT images are used to determine the optimum location for titanium implants and avoid critical nerves, sinuses and areas of low bone density, They can also be used to create an extremely accurate surgical guide for the most accurate dental implant placement available. Orthognathic Jaw Surgery and Temporomandibular Joint (TMJ) Disease: Patients benefit when specialists can evaluate their anatomy with the 3D perspective that CBCT provides. Endodontics: Dentists performing intricate procedures (complex root canals, for example) can benefit from a clearer visualization of the tooth's anatomy, or use a CBCT image to determine why a treated tooth may have failed (root fracture, missed canal, etc). Sleep Apnea: Imaging the tissues and structures of the nose, mouth and throat can aid in diagnosis and treatment of this potentially dangerous condition. Each patient's situation is different and must be carefully evaluated by a clinical professional before any test or procedure is performed. While 3D CBCT delivers a much smaller dose of radiation than other types of CT imaging, like all X-rays it still carries a small risk. We will take into account all risks, benefits and alternatives before recommending any medical procedure.